The world's greatest fantasy setting comes to the world's most popular roleplaying game rules. 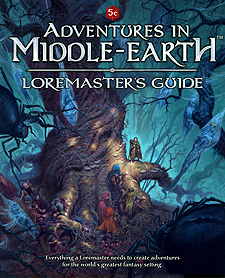 This Loremaster's Guide presents inspiration, guidance and additional new rules to help you create and run encounters, adventures and campaigns in the world of The Hobbit and The Lord of the Rings, using the OGL ruleset. The quest that began in the Player's Guide continues in this lavishly illustrated,hard cover Adventures in Middle-earth Loremaster's Guide. Packed with setting information, Loremaster guidance and expanded rules, this volume is an invaluable resource for your games. Best used with the Adventures in Middle-earth Player's Guide, and the latest edition of the world's favourite roleplaying game.